As a military Order, Saint Lazarus has a rank structure that conforms with European chivalric custom, and decorations (medals) to note service or achievement. This means that active, involved Members enjoy promotions up through the ranks, with the ultimate achievement of Knighthood or Dame as an honor and privilege bestowed upon those who selflessly serve the charitable mission of the Order. Ranks in the Order of Saint Lazarus - Grand Priory in Canada is divided into two categories; (1) Civilian and Military membership, and (2) Clergy membership. Medals are awarded for rank. Medals of rank may be proudly worn at functions of the Order and on formal occasions. The presentation below depicts the insignia for each rank, including their miniature counterparts along with a description of each of the insignia. The purpose for such a detailed presentation is to not only include the public on the symbolism found within the Order, but to members of the Order as well as part of their education. The design of the insignia leverages the hundreds of years of the existance of the Order, stemming from the symbols from its earliest days as an order. Obverse: An eight-pointed, 40mm wide, cross of green enamel edged with white and silver suspended from a 38 mm green moire ribbon. In the centre is an oval medallion depicting the raising of Lazarus. The upper portion (the sky) is enameled white. Around the border of the medallion is a border of pale green enamel with "ATAVIS ET ARMIS" in silver letters. Reverse: As for the obverse. The miniature is a reduced version of the medal edged in silver suspended from a miniature 16mm green moire ribbon. The insignia is identical for both male and female members. Obverse: An eight-pointed, 40mm wide, cross of green enamel edged with white and silver suspended from a 38 mm green moire ribbon. In the centre is an oval medallion depicting the raising of Lazarus. The upper portion (the sky) is enameled white. Around the border of the medallion is a border of pale green enamel with “ATAVIS ET ARMIS” in silver letters. The miniature is a reduced version of the medal edged in gold suspended from a miniature 16mm green moire ribbon. Obverse: An eight-pointed, 51mm wide, cross of green enamel edged with white and gold suspended from a 38 mm green moire ribbon and worn from the throat as a neck badge. In the centre is an oval medallion depicting the raising of Lazarus. The upper portion (the sky) is enameled white. Around the border of the medallion is a border of pale green enamel with “ATAVIS ET ARMIS” in gold letters. The miniature is a reduced version of the medal edged in gold suspended from a miniature 16mm green moire ribbon. On the ribbon is a silver bar surmounted by a silver Maltese cross placed horizontally at the middle of the ribbon. Ladies have the option to wear the insignia suspended from a bow mounted on the left breast rather than from the throat. The medal is suspended from a military trophy and worn at the throat as a neck badge. The military trophy shows a shield bearing the Arms of the Order in white and pale green enamel surrounded by various weapons and flags. The shield is surmounted by a brass plate bearing an eight-pointed cross in green enamel which is in turn surmounted by a helmet bearing a coronet and plumes. Obverse: An eight-pointed, 64mm wide, cross of green enamel edged with white. In the centre is an oval medallion depicting the raising of Lazarus. The upper portion (the sky) is enameled white. Around the border of the medallion is a border of pale green enamel with “ATAVIS ET ARMIS” in gold letters. Set between the limbs of the cross is the cypher “SLJ”. On the ribbon are 2 silver bars each surmounted by a silver Maltese cross placed horizontally one third and two thirds of the distance from the top to the bottom of the ribbon. The medal is suspended from a wreath of laurel and oak leaves in green with the monogram "SLJ" in the centre and worn at the throat as a neck badge or on a bow. Obverse: An eight-pointed, 40mm wide, cross of green enamel edged with white. In the centre is an oval medallion depicting the raising of Lazarus. The upper portion (the sky) is enameled white. Around the border of the medallion is a border of pale green enamel with "ATAVIS ET ARMIS" in gold letters. Set between the limbs of the cross is the cypher "SLJ". The miniature is a reduced version of the medal suspended from a miniature 16mm green moire ribbon. The throat badge is the same as the Knight. The insignia also includes a gold eight-pointed star burst with the medal superimposed worn on the left breast. On the ribbon is a gold bar surmounted by a gold Maltese cross placed horizontally at the middle of the ribbon. The throat badge is the same as the Dame and may be suspended from a bow. The insignia also includes a gold eight-pointed star burst with the medal superimposed worn on the left breast and a 102mm wide green moire ribbon, worn over the right shoulder with the medal suspended from the trophy and fastened below the bow at the left hip. On the ribbon are 2 gold bars each surmounted by a gold Maltese cross placed horizontally one third and two thirds of the distance from the top to the bottom of the ribbon. 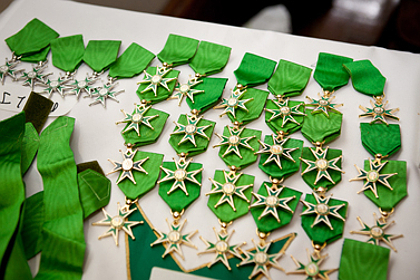 The insignia also includes a gold eight-pointed star burst with the medal superimposed worn on the left breast and a and a 75 mm wide green moire ribbon, worn over the right shoulder with the medal suspended from the bow and fastened below the bow at the left hip.